Hola, folks! I had picked up a new hobby in Goa, after my fire-dancing Mexican friend Xanti introduced me to it. She taught me a few basics of hula hooping! Later, my Mumbai friend Leona Rodrigues put in some more hula hooping talent in me. 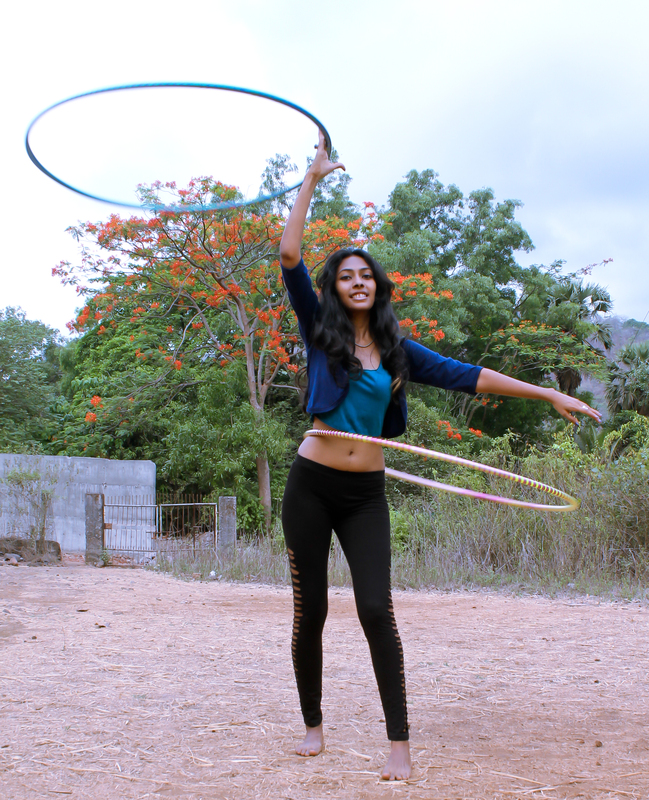 So I’m now back in Mumbai, conducting hula hooping workshops for adults and kids, and boy, it’s fun! Last month was the high point of my hula hooping experiences as I tried fire hooping for the first time! It means that I set a hoop on fire and then went about spinning it. I was pretty excited to try fire hooping and here’s a short video of me trying it for the first time. I was tad awkward in the beginning, but I soon forgot about everything else around me and could only hear the loud ‘whoosh whoosh’ of the fiery hoop around me. It’s only towards the end that my friend calls out to warn me about some other people’s football about to hit me, that my concentration breaks and then thee’s a bit of a singeing scare! Tell me what you think of it! And if you’re in Mumbai, come join me at one of my workshops… I assure you it’s much fun! I’m going to undergo an eye surgery later this month, which will require me to not: watch the TV, work at the computer or read books, till September end, to avoid straining my eyes. So I’m going to take up this time to work furiously on my Life List’s item no. 10 , where I hope to listen to 100 new, recommended songs. I need all of you to give me your 5 most favourite songs that you think I should listen to. Drop song names in the comments section; that way, others can pick up your recos too. The tracks needn’t be only in English; any languages are welcome. Along with song titles (and album and artist’s name, of course), add a link if a website’s explaining how/why the song was composed, any other significance, any other important part of the history associated with the song, etc etc. I’ll use YouTube to listen to the numbers. But it would be helpful it you could post the direct link of the song, as there will be numerous versions of the said number on YouTube alone, and I want to ensure I listen to the one YOU recommend. So yeah, hit me with your best songs! So, this isn’t a Life List item, but pretty important for me to have done it. At least once! I’m talking about visiting a karaoke bar and actually singing a song in public there! Ok, well, so there wasn’t really a lot of public around, but well. I was holidaying in Goa during my 24th birthday with two friends. Post dinner we headed to the karaoke bar upstairs, notes from where we had heard during our dinner. No one knew me in Goa, and it was my birthday, so I shook off the shyness and took the plunge. The song that was sung: Sweet Child O’ Mine by Guns ‘N’ Roses. Tip: It was SO much fun, all of you MUST do it. And yeah, karaoke bars are definitely going to see more of me! In Sep, 2010 I had struck off another item from my life list but couldn’t write about it as I wasn’t documenting my list here, on the blog. Here’s to catching up! I flew out of India in Sep 2010 and visited a foreign land, which happened to be Mauritius. It is a small island country next to Madagascar, to the East of Africa. I stayed there for a week and had a good fill of indulging in typical touristy activities. Water sports, without a doubt, were the highlight of the trip. Fabulous beaches, pleasant weather and 4-star hotel accommodation only made the experience more memorable. Mauritius is a chilled out place, where you won’t really find too much to do. Sure, the country has its share of casinos and nature parks and botanical gardens… But the excellent weather scores the highest. I met several European travellers on my trip, so I’m assuming Mauritius is popular with them. Chilling in my room in Jalsa beach hotel in Mauritius. The picture above is of my hotel room, which opened out to a garden and the path to the beach. The one below is of a clump of soil in seven different colours, caused due to volcanic activity. It’s a fenced area and a pretty quirky handiwork of nature. In the last picture, I am at the Casela Bird Sanctuary, where I had the pleasure of meeting this 60-year tortoise, who looked to me just like the ones in Mario! This is where the soil is of seven different colours - vestiges of erstwhile volcanic activity on the island.